technical support team to solve your concern at the earliest. the customers as well as to the partners regarding software related issues and queries. Marg care is committed to provide best in class customer care which is promptly accessible to help and give its clients extreme help. Our different and exceptionally talented worldwide workforce provides the maximum support to the customers as well as partners regarding the software. On calling us the customer care takes the call of the customer and provides them a solution accordingly. On providing a resolution to the query a message will be triggered to the client so that they could provide us with a valuable feedback for the last call. 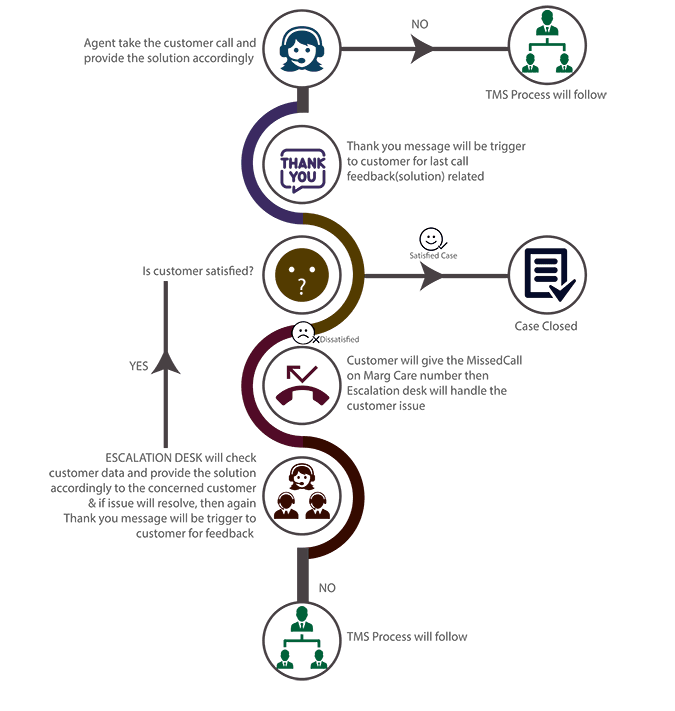 In case of any unresolved issue the Customer care will transfer the call to the Escalation desk will handle the customer issue. The Escalation Desk on resolving the issue send a thank you message which will trigger to the customer as a feedback. Ticket management system is a computer software package that manages and maintains lists of issues as needed by an organization. The Agent who had received the call of the customer forwards the call to the next level i.e. to Supervisor. The Supervisor Team will check the data of the customer and tries to resolve it on his level first. If the problem has been resolved, the case is closed. And if the problem is not been solved by the Supervisor Team then it is forwarded to next level i.e. Team Leader. The Team Leader will check the customer data and provide the appropriate solution else will forward to the next level i.e. IT Team & Development Team. The IT Team & Development Team will check the customer’s concern and provide them the solution else will escalate the issue to the Management. The Management will resolve the issue else if found not feasible then the case will be closed.